On my recent trip to L.A. I had the opportunity to photograph the HOLLYWOOD sign nestled majestically among the hollywood hills. This landmark has come to symbolize the city and the movie making industry that has made it famous. After a bit of post-travel research I discovered a few interesting tidbits I would like to share. Erected in 1923 during a massive real estate boom, the sign was intended to be an advertisement for a new upscale Hollywood development called HOLLYWOODLAND. 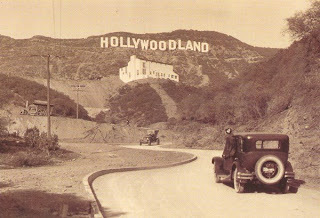 Built for the Los Angeles Times publisher Harry Chandler, the giant billboard was supposed to be up for the time it took to sell off his real estate investment. Needless to say, its lasted a tad bit longer than that. How a propos that this symbol of L.A. was originally designed to sell the suburbs that have now come to symbolize the dominant physical layout of this area. Its always been about real estate. The sign originally lit up - first 'HOLLY' then 'WOOD' and finally 'LAND' blinked on and off. After the boom, the proverbial bust caused all this glitz to stop. 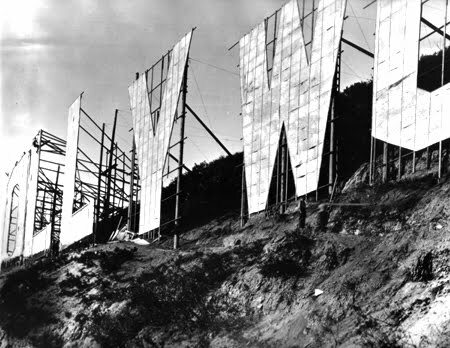 Post-war L.A. real estate lost a bit of its luster, and so 'LAND' was dropped from the billboard and the sign became not an ad for real estate but a symbol of the movie business. Like the industry it represents, the infamous sign has been in the headlines recently. As in times past, it's in need of some upkeep and so the City of Angels is asking all its stars to divy up some hard cash to help out. Hugh Hefner was there back in 1978 to raise funds to build an entirely new sign and now in 2010 he's stepping up again to help out. Gazing out at Mount Lee in glorious Griffith Park, I silently thank Hef for his contribution. Now if they could just get it to light up and blink again.